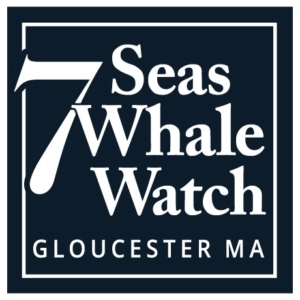 Each year, usually in the early spring, a few lucky whale watchers from Gloucester are privileged to catch a glimpse of one of the rarest of all the great whales … the Northern Right Whale. These 50+ foot giants were called “the right whale to kill” by early Basque-style whalers who hunted these animals in New England waters starting in the early 1600’s. Whalers called them the “Right Whales” because they were the most profitable and easiest to catch. They are slow moving, live close to shore, and yield massive amounts of blubber and baleen when killed. Both blubber and baleen (or “whalebone” although it is not actually bone. It’s “keratin”, the same substance as your fingernails, toenails, and hair as well as Horse’s hooves) were very sought-after products by early whalers. The baleen was made into buggy whips, the ribs in umbrellas, the “stays” in old-fashioned corsets, and even surgical stitches! The blubber was melted down and used as fuel in lamps and lighthouses. Ironically, if oil had not been discovered as a cheaper alternative source of fuel in Pennsylvania in the 1860’s Right Whales (and probably Humpbacks too) would have become extinct prior to the 20th century. Oil represented a cheaper, easier to obtain an alternative to whale parts. So what started global warming may have saved the whales! And you thought being an environmentalist was easy! From the early 1600’s until they were federally protected in 1935 hundreds of thousands of Northern Right Whales were killed and now fewer than 300 remain in existence. Each year a small number of the few remaining Right Whales will pass through our area, possibly while migrating to or from their feeding grounds in the Bay of Fundy and their calving grounds off the Georgia/north Florida coast. Because they are so critically endangered federal law prohibits any vessel from intentionally approaching these animals closer than 500 yards. But even from a great distance away it is something to see the rarest and most endangered of all the great whales. Right Whales can be recognized by their large size (slightly larger that Humpbacks), rotund body, and by their conspicuous lack of a dorsal fin. Even from a great distance, experienced whale watcher can be alerted to the possible presence of a Right Whale just by the shape of the animals “blow” or “spout”. You see, all baleen whales (or “Mysticetes”) such as the Humpback Whale, Fin Whale, Blue Whale, etc, have a double opening on top of their head through which they breathe. Toothed whales (or “Odontocetes”) such as Dolphins have a single opening. In the Right Whale, the two openings are so widely spaced that, when viewed from in front of behind, the spout looks like a “V”. Humpback Whales also sometimes display a slight “V-shape” to their spout but nothing like the Right Whale. One of the most curious aspects of the Right Whale’s appearance is the hardened “callosities” on their heads. These callosities are actually concentrations of “Cyamids” or “whale lice” that infest wrinkly patches of skin on the Right Whale’s head. Every Right Whale is born with a different pattern of wrinkly skin on their heads and therefore develop a different pattern of callosities as Cyamids occupy these wrinkly patches later in the whale’s life. As you may have guessed, researchers can, therefore, use the pattern of callosities to identify individual Right Whales and that is how we know that only about 300 of these whales remain. A whale with a continuous ridge of callosities along the entire length of its rostrum is said to have a complete “Bonnet”. Most Right Whale, however, has a “broken bonnet” which consists of small “islands” or patches of callosities.